In U.S. grocery stores, most packages of white rice include instructions for a hybrid cooking method, combining parboiling the grains at a simmer with steaming the rice after most of the cooking liquid evaporates. This may reflect an assumption that most U.S. kitchens don't have a rice cooker, the stovetop appliance that makes it easy to steam tender rice. But steaming rice on the stovetop in a pot can be done with a few simple steps. When steaming anything, the amount of water used differentiates the process between boiling and steaming. Boiled rice remains fully submerged in liquid for the cooking time, whereas steamed rice relies on the heat of trapped vapors to soften the grains. 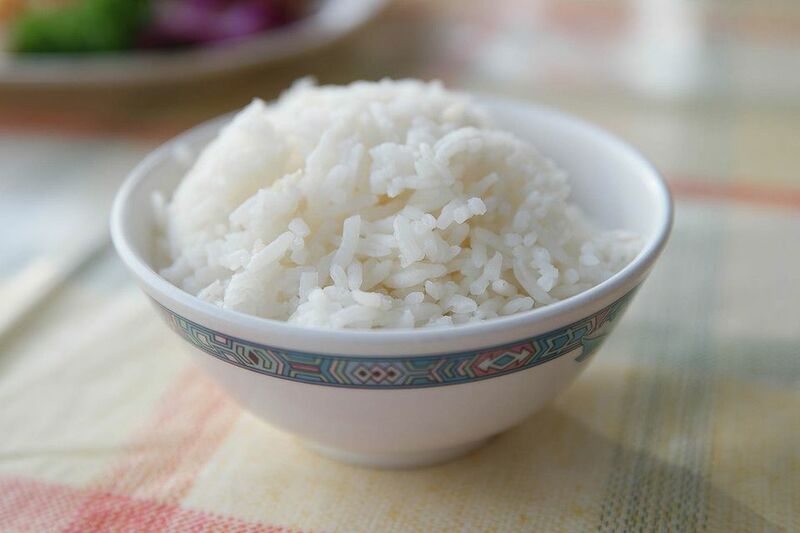 You can produce fluffy, tender steamed rice on the stovetop by adjusting the amount of water you use. Boiled rice tends to produce a firmer, more distinct grain, and works better with long-grain varieties such as basmati. Steaming turns out a stickier rice, which works well for sushi or dishes that might be eaten with chopsticks, and recipes that generally call for a shorter-grain rice, such as Spanish Valencia or Calrose. Some packages of rice or recipes for cooking rice instruct us to first rinse the grains in cold water. Doing this, however, can wash away some of the nutrients, particularly with rice labeled "enriched." Rinsing also removes extra starch and results in distinct grains, so if want to keep the grains separate and firm, rinse the rice in two or three changes of water until it runs clear, with no milkiness in the liquid. For a softer texture or shorter cooking time, you can soak rice for 30 minutes before you cook it. This preserves some of the aroma and flavors of the longer-grain varieties such as jasmine. You may want to change the amount of water based on what type of rice you are cooking and what final texture you are looking for. To steam rice using the standard stovetop simmer method for most medium- and long-grain varieties, start with a 1-to-2 ratio. For example, 1 cup of uncooked rice, which serves 2 to 3 people, needs 2 cups of water. Bring the water to a boil and add the rice, salt to taste, and butter or oil, if desired. Reduce the heat to low and cover the pot. Simmer the rice for 20 minutes without lifting the lid. Remove the pot from the heat and let it stand for an additional five minutes. Fluff the rice with a fork and serve. To produce a stickier result with medium- to short-grain rice, reduce the amount of water to a 1.25-to-1 ratio. For example, 1 1/4 cups water for 1 cup of rice. Combine the water and rice in a saucepan with a tight-fitting lid and stir. Bring the water to a boil and cook, uncovered, until the water level drops below the surface of the rice, approximately 5 minutes. Reduce the heat to low and cover the pot. Simmer the rice for an additional 15 minutes without lifting the lid. Remove the pot from the heat and let it stand for an additional 5 minutes. Brown rice requires roughly 50 percent more water and double the cooking time. To achieve the signature creaminess of risotto, cooks add a 4-to-1 ratio of liquid to the rice in intervals accompanied by constant stirring. Boiled rice, a more standard preparation in Indian cuisine, starts with enough water to cover the rice by an additional inch or two, maintaining a moderate boil throughout the cooking time. Any remaining water is drained once the rice reaches the desired texture.